Item is a typed record of meeting minutes from a General Membership meeting. Items discussed included a Board Members report by Hatti Prentiss, a financial report by Roger Savage, and a proposal by Garry Conway. 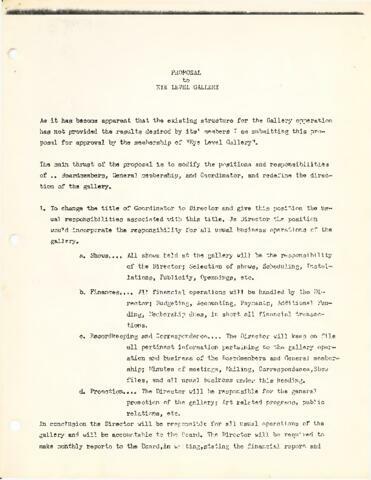 Item also includes the proposal to the Eye Level Gallery by Garry Conway, which included changing the name of the Co-ordinator position to "Director" as the title reflects the role more appropriately. He also proposes that the policies of the gallery will be the responsibility of the Board of Directors. Conway ends his proposal by stating his interest in taking on the role of the Co-ordinator or Director position.